Darya Klishina is a Russian long jumper. She’s known for winning the 2011 Paris European Championships, along with earning a silver medal at the 2017 World Championships in London. Her journey into athletics began when Darya was 8. Following in the footsteps of her father, who was a former athlete himself, Darya has since gone on to make her name as one of the world’s best female long jumpers. Darya Klishina was born in 1991, in Russia. Her beginnings in sports date back to when Darya was 8. This is when she first started playing volleyball. Over the years, as Darya’s interests in sports grew, she made a transition to athletics. With her father as her influence, she went on to become a long jumper. Darya’s first major contest in the long jump came in 2010. It didn’t take her long to impress everyone with her performances – achieving a 7.03m jump. With this feat, Darya broke the Russian junior record and made the second-best jump in the junior category of all time. Not only that, but Darya’s jump was also the second-highest in the world in 2010; she was behind only her national teammate Olga Kucherenko, who achieved a 7.13m jump. For the next several years, Darya made her name as one of the rising talents of the Russian athletics. In fact, her performances led her to get qualified for the 2016 Summer Olympics. She packed her bags and traveled to Rio De Janeiro where the Olympics were held. She ultimately made her way through to the finals, finishing in 9th place. One year after the Olympics, Darya took part in another huge event. This time it was the 2017 World Athletic Championships held in London. Darya managed to achieve the season-highest jump of 7.00m at the event, earning a silver medal. She was only 2 centimeters shy of being the gold medalist. Darya continues to compete and set new records in athletics. So far, her highest ever-long jump has been 7.05m, which she achieved in 2011 in the Czech Republic. However, if her achievements so far are anything to go by, who knows how many records she’ll break in the years to come. 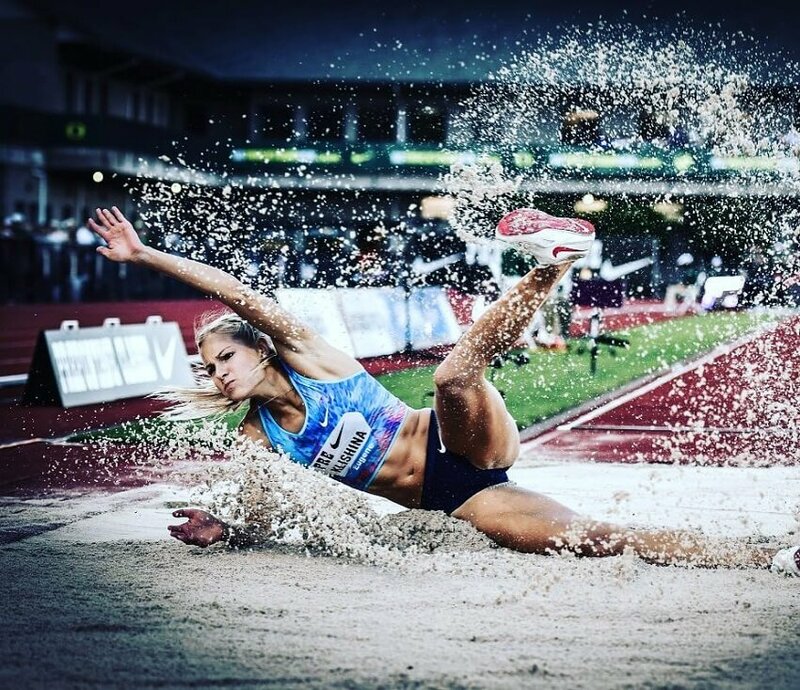 As a professional athlete, Darya Klishina follows specific training drills that help increase her long jump. These include body weight movements, but also gym exercises. Front squats, dumbbell step-ups, and counter-movement jump are just some examples of these exercises. Darya has to follow a specialized diet that allows her body to perform at its peak during competitions. This includes eating a good amount of carbs and fats for energy, along with proteins that nourish and repair her muscles. Darya’s first influence was her father, who was a former athlete himself. He inspired her to start competing in the long jump, something that Darya is very proud of. Darya Klishina has gone from playing sports as a hobby to turning into a world-class athlete in the long jump. What we can learn from her, is that every day brings an opportunity to follow your passions. If you want to live the life of your own creation like Darya, then you should put in the work necessary to get there. Do you like this profile? Receive workout guides, tips and news from some of the most legendary athletes on the planet. © Greatest Physiques. All rights reserved.